I’ve decided to devote August to the novel again, in one final push to get it finished. If I manage to write The End on or around the 31 August, that will give me two months in which to get feedback from test readers and work on a second draft and a polish before I have to deliver the book at the end of October. A couple of things got in the way of writing the novel during June and July. Mainly holidays, short story deadlines, public readings, and fretting over Blonde on a Stick (which is to published imminently). But there was also a problem with notes. Until recently, I’d (rather foolishly) been an advocate of ‘one notebook per project’. But this never worked out, mainly because I’d sometimes have an idea and have to write it down in a different notebook because I couldn’t remember where I’d put the relevant one. Cue madness. So from now on, it’s one notebook for everything, until it’s filled. As I mentioned elsewhere, I use a hardback Moleskine notebook, the kind that has ruled lines and an elastic closure. I number the pages (which gets me quickly past that tricky ‘how can I bear to deface its pristine loveliness’ stage) and mark on the side the date when I started using it. And now I take it everywhere. All ideas go in there. Also, if I see a picture I like, or an article in a newspaper, I’ll paste it in or store it in the back wallet for processing later. They’re not cheap, but they last me a long time (I write small… two lines of text to one line of rules paper) and I need something that isn’t going to fall apart after six months in my back pocket. But a lot of information destined for Loss of Separation (should that be Loss of Preparation?) has been gathered from various sources and is now safely collected in a folder. I’ve just been through it, assessing, discarding, and tucking new sections into the novel’s outline onscreen. I’ve got the novel pretty much nailed now, in terms of plotting. Here’s a screen grab of the corkboard in Scrivener, to show you what I’m working from. 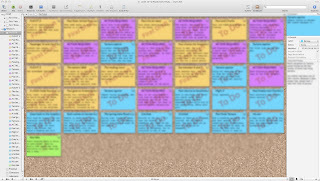 The orange index cards are completed chapters. The purple cards are ‘action required’ notes appertaining to the chapters to their left. Blue squares are chapters waiting to be written. The green card at the end is the ‘key’ that explains the whole book, the thing I need to keep focused on. It might not mean much to you, but sorting out those notes has helped to open up the novel to me in a way that wasn't happening before. Those colours represent a new balance, a more streamlined and ordered story, and an avenue of escape towards closure (well, that's what I'm hoping). So if you have a couple of minutes each day, please drop by to keep me company. As before, I’ll be posting word counts, progress reports, tips and tricks… moans… anything that occurs to me about the writing process while I’m trying to put this novel to bed. Feel free to send me comments and questions. Glad to see you're back, Conrad. Looking forward to the updates on the final push. Good to have you back, Conrad, look forward to the August updates.